Multiple police and rescue crews responded to a crash on the Turnpike Monday morning which involved an unmarked police car. 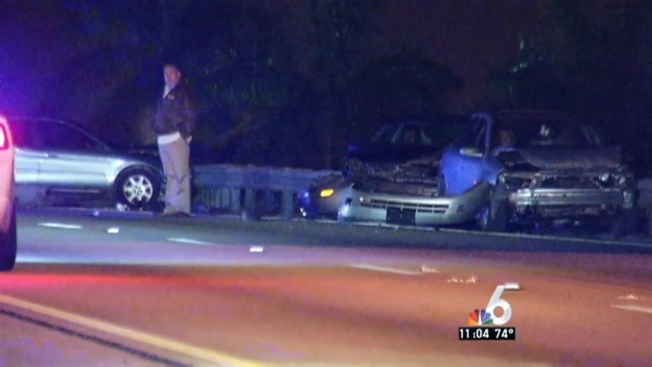 The crash occurred just before 4 a.m. on the Turnpike south at Exit 11/Southwest 216th Street in Miami-Dade. According to investigators, three vehicles, including an unmarked police car, were headed southbound on the Turnpike extension when one of the cars struck the other. The driver that was struck lost control and sideswiped the unmarked police vehicle. The crash blocked all lanes on the Turnpike south. The on-ramp was also closed. The lanes have since been reopened. No injuries were reported as a result of the crash.